This week, before the Bach to Bluegrass; the enchanting sounds of Diana Krall; and soul and hip-hop rhythms of singer Erykah Badu, funk/jazz/rock/hip-hop sounds will be played by New Orleans native Trombone Shorty alongside the high-energy show of socially-conscious artist Michael Franti and his band Spearhead. 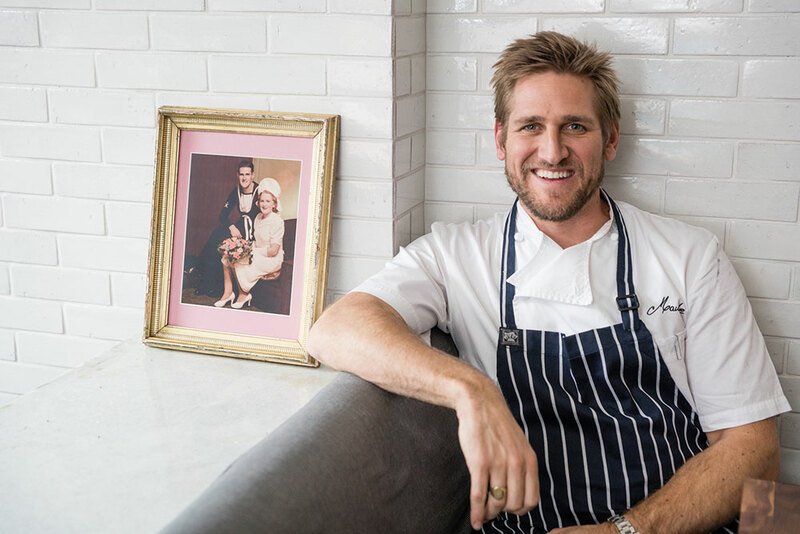 Australian chef Curtis Stone has hit the bulls-eye with his restaurant, Maude, thanks to a simple yet innovative seasonal menu. Makes about 1 ½ quarts. Make-Ahead: The vegetables and bread can be soaked up to 1 day ahead, covered and refrigerated. The finished soup can be made up to 1 day ahead, covered and refrigerated. In a heavy large sauté pan set over medium-high heat, add the baguette, cut side down. Cook without turning for 6 to 7 minutes, or until the bread is charred. Transfer the bread to a cutting board and cut into 2-inch pieces. In a large bowl, mix the milk and crème fraîche. Add the cut bread and set aside at room temperature for 15 minutes. Stir in the cucumber, grapes, cilantro, almonds, onion, and lemon juice. Cover and set aside at room temperature for about 25 minutes, or until the bread softens. Working in batches and using a blender, puree the milk mixture until smooth. Strain the gazpacho through a fine-mesh sieve, using the back of a ladle to push through as much liquid as possible; discard the solids. Season the gazpacho to taste with salt and more lemon juice if necessary. Divide the cucumber, grapes, radishes, and almonds among 6 small bowls. Pour about 1 cup of soup over the garnishes. Drizzle with some extra-virgin olive oil, if desired, and serve immediately. Prep Time 15 minutes, plus 1 ½ hours for the dough to rise; Cook Time 55 minutes. Make Ahead: The piperade and aïoli can be made up to 3 days ahead, covered and refrigerated. The focaccia can be baked up to 1 day ahead, cooled, wrapped tightly, and stored at room temperature. The sandwiches can be assembled up to 2 hours ahead. Wrap each sandwich in plastic and keep in the refrigerator or cooler until ready to serve. In the bowl of an electric stand mixer, whisk the yeast and 2 ⅔ cups of warm tap water (about 110 degrees). Let stand for 5 minutes. Add ⅓ cup of the oil and whisk until the yeast has dissolved. Add the flour and kosher salt. Using the hook attachment, knead on low speed for about 2 minutes, or until the dough has come together. Increase the speed to medium and knead for about 2 minutes, or until the dough is smooth and pulls away from the sides of the bowl, but is still sticky to the touch. Shape the dough into a ball and place in a large oiled bowl. Cover and place in a warm area for about 1 hour, or until the dough has doubled in size. Position a rack in the lowest level of the oven and preheat the oven to 450 degrees. Brush 3 tablespoons of oil on the bottom of a large heavy rimmed baking sheet. Scrape the dough onto the baking sheet and, using oiled hands, gently press the dough over the sheet to cover the sheet completely and into the corners of the sheet. Cover and let rise for about 30 minutes, or until puffy. Using a pastry brush, lightly pat the remaining oil over the dough. Using your fingers, dimple the surface of the dough all over. Sprinkle with flaked sea salt. Transfer to the oven, immediately reduce the oven temperature to 425 degrees, and bake the focaccia for 20 to 25 minutes, or until it is golden brown and firm to the touch. Transfer the focaccia onto a rack to cool completely. Heat a large sauté pan over medium heat. Add the oil and then add the onion and sauté for about 8 minutes, or until the onions are tender and beginning to color. Add the bell peppers and chiles and season with salt. Cover and cook for about 10 minutes, or until the peppers soften slightly. Add the tomato paste and Piment d’Espelette and cook uncovered for about 10 minutes, or until the peppers are tender. Set the aside to cool to room temperature. Stir in the olives and parsley. Season to taste with salt. In a food processor, blend the garlic, Dijon, lemon juice, and egg yolks until smooth. With the motor running, slowly add the oils, blending until emulsified and creamy. Add enough water to thin the aïoli to the desired consistency. Season to taste with salt. Cut six 4-inch squares of the focaccia and cut each square horizontally in half. Spread some aïoli over both cut sides of the focaccia. Place about ⅓ cup of the piperade onto the bottom focaccia halves. Scatter some sliced cornichons over the piperade and top with the arugula and bresaola. Place the focaccia tops on the sandwiches and serve. Prep Time: 5 minutes, plus 8 hours to set. Cook Time: 1 hour and 5 minutes. Make Ahead: The panna cotta can be made up to 2 days ahead, covered and refrigerated. Position a rack in the center of the oven and preheat the oven to 250 degrees. Scatter the chocolate in a shallow 11 by 8-inch glass or ceramic baking dish. Roast the chocolate in the oven for about 1 hour, stirring and smearing with a clean and dry silicone spatula every 10 minutes, or until the chocolate has turned a deep golden brown. The chocolate will become thick and crumbly during roasting, but it will smooth out as it caramelizes. Transfer the caramelized chocolate to a large heatproof bowl and let cool. Meanwhile, pour the milk into a small saucepan. Sprinkle the gelatin over the milk and let stand for about 10 minutes, or until the gelatin has softened. Bring the milk to a boil over medium heat, whisking until the gelatin has completely dissolved. Pour about ⅓ of the milk over the chocolate and whisk until blended. Add the remaining milk and whisk until smooth. Add the cream and salt and whisk to blend. Let the panna cotta mixture cool to room temperature. Divide the panna cotta mixture among six 8-ounce mason jars set on a small baking sheet (there should be about 5 ounces of mixture per jar). Screw the tops on the jars and refrigerate the panna cotta for at least 8 hours or overnight, or until the panna cotta is set. Spoon some passion fruit pulp over the panna cotta and serve. Set out any remaining passion fruit pulp and encourage guests to add more as needed. Led by the lively Nicholas McGegan, this splendid French-themed evening features the Bowl debut of 21-year-old French cellist Edgar Moreau. New Orleans native Trombone Shorty fronts one of the hottest funk/jazz/rock/hip-hop bands and never fails to bring the party atmosphere. Socially conscious artist Michael Franti and his band Spearhead play unforgettable, high energy shows merging thought-provoking lyrics with old-school R&B, soul and hip-hop beats. Led by the ebullient Nicholas McGegan, this eclectic evening of charming works is enhanced by the virtuosity of Grammy®-winning double bass player Edgar Meyer, who has the chops to play everything from dazzling Bottesini to toe-tapping bluegrass. Enchanting singer/pianist Diana Krall joins the LA Phil, bringing her warm style to jazz standards, delicate ballads and songs from her latest album, Wallflower. Powerful baritone Gregory Porter opens with his unique style: jazz infused with soul, blues and R&B. With deep grooves from hip hop, jazz & ’70s soul, the spirit of Baduizm moves the body and mind. St. Vincent’s inventive guitar work and melodies are gorgeous and uncanny. Captivating singer Sumney opens.